Last fall, Jeff Kippley was amazed at the numbers he saw on his yield monitors. For the first time, his combine with an older John Deere 1290 head was capturing more bushels than the newer John Deere 612 corn head. In a world of $3 corn, farmers looking for higher yields may not have to look much further than what's already in their field. Operation Harvest Sweep, a product sold by Leading Edge Industries based in Groton, is a chain that can be attached to a combine and has been found to reduce up to 85 percent of shatter loss during harvest, according to the company's vice president of marketing and sales, Lucas Pearson. The readers of Farm Industry News selected Operation Harvest Sweep as one of the top product introductions of 2015. This is the second year in a row for Leading Edge Industries, which earned a FinOvation award last year for the Load Judge. 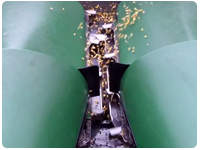 Leading Edge Industries Inc. of Groton, S.D., this year launched a new product - Operation Harvest Sweep - an attachment kit that installs on corn headers to reduce shatter loss. 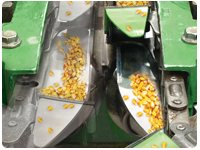 Since the corn header was invented in 1954, shatter loss has been an issue during harvest. In the best of conditions, the loss may be minimal. But in stressed corn, it can result in a 7- to 8-bushel-per-acre loss. Shawn Gengerke, CEO and founder of Leading Edge Industries, decided this loss was no longer acceptable. For the past sixty years, farmers have dealt with corn shatter. This is when the kernels fall off the cob when they are removed from the earth, leading to financial losses.